The Peace and Freedom Party supports Adam Shbeita’s write-in campaign in the 37th Congressional District. For information on voting for write-in candidates, see this article. For a map of his district, see the bottom of this page. Write in Adam Shbeita for Congress in the 37th District. In the June 5 election (for which mail voting has already begun) the incumbent in the 37th Congressional District appears alone on the ballot. The only way to provide some opposition in the November general (runoff) election is to write in the name of Adam Shbeita in June. In Los Angeles County, write-in votes can only be cast by writing both the title of the office and the name of the candidate in the write-in spaces on the folder in which the ballot is enclosed. For title please write “House of Representatives,” and for name please write “Adam Shbeita.” If Adam receives enough write-in votes, he will appear on the November ballot as the only challenger to incumbent Karen Bass. Karen Bass is certainly not the worst member of Congress. But as she did when in the state legislature, she has become increasingly accommodating to the powerful big-money interests that oppose the programs and policies that would really benefit workers. On issue after issue, she has been silent, deferring to the administration. We need to shake things up, and fight for working people! Adam Shbeita will raise the real issues that make the difference for the 99%. Peace. Stop the pointless, endless wars, and bring our troops and money home. Jobs. We don’t need talk about jobs, we need jobs. Real jobs. Tax the rich. Shift the tax burden from workers to the super-wealthy. Health care. The “public option” needs to be made real, and we need decent health care for all our people. Immigration and human rights. Stop the mass deportations, and provide appropriate documentation and real opportunities for legalization. The only way to raise these issues – or for that matter, any issues at all – in the 37th District this year is to write in Adam Shbeita. 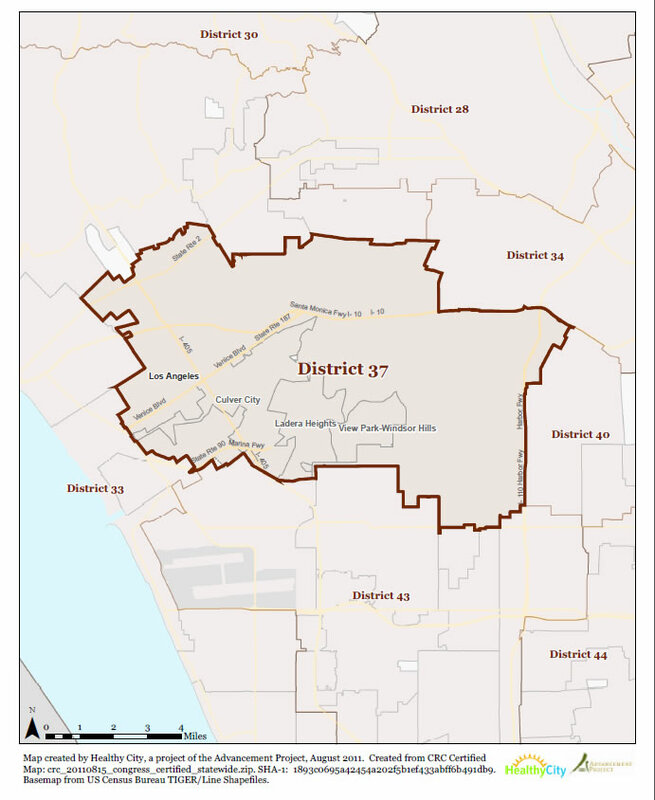 The 37th Congressional District is located entirely within Los Angeles County. For a more detailed map that you can zoom in on, click here. For a larger image of this map, click here.